We all know and love Bunny; she was a Moderator over in my Group for years and is still around as a fellow member now, offering good advice, encouragement and plenty of know how. In fact, although she's not a Moderator anymore, she'll always be an Honorary Moderator because she's a part of the fabric that is my Online Quilt Group. Bunny has made many -in fact, most of my quilts and they're all utterly beautiful. She's always an inspiration and her colour choices always leave a lasting impression. Here is her Secret Garden quilt top before quilting. I love these before pics, they're hugely motivating. My own Secret Garden is in a similar state - in need of quilting and I can't wait to show it off once it's finally finished. What can I say? It's on the WIP pile.. But back to Bunny - how harmonious are these colours? They're so beautiful, I just love how this quilt looks. If you'd like to read more about Secret Garden, you can check out the Secret Garden post archive right here on this blog by clicking the image below. 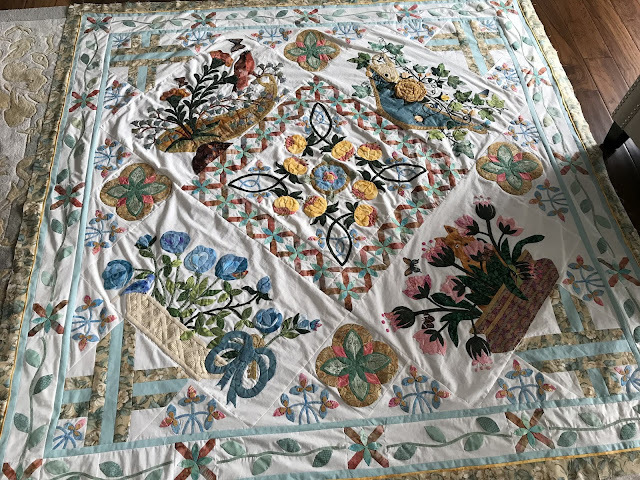 Thanks to Bunny for sharing her quilt progress with us all to take inspiration from. If you'd like to see more finished quilts made from any of my patterns, visit my Open Gallery. It's a place for all quilters who make any of my quilts to show off their creations in a central online gallery. It's new and I hope you'll join us by adding your own quilt there. Submitting your quilt pics is easily done via an upload screen directly on my website. Click here now if you'd like to submit your own quilt. Thank you so much for commenting. I moderate comments to block spam so don't worry if your comment doesn't appear instantly. Forget Me Not: Like It? Make It!